25-year history working with top designers, firms and companies nationwide. Design, fabrication and installation for companies nationwide on small and large scale projects. Experienced team of engineers and project managers who are organized and focused on the deadline of your project. 70,000 square-foot manufacturing facility that combines state-of-the art equipment with one of the most innovative printing systems in the U.S.
A long list of satisfied and returning customers providing great references. Design is important for developing and maintaining brand awareness; its intent shouldn’t be restricted by the capabilities of a sign developer. That’s why L&H Companies invests in the latest fabrication technologies to open new doors for designers to create cutting-edge concepts. We match manufacturing capabilities with design to help make your signage different, unique and successful. In short, if you can design it, we can build it. L&H Companies gives designers increased application possibilities and printing effects that provide more flexibility and customization in sign design. For example, our two EFI VUTEk digital printers use a revolutionary white ink technology to print in-line with a unique three-layer capability offering. These groundbreaking printers produce vibrant colors superior in hue when compared to washed-out colors from standard digital printers. It also means we can offer a larger array of colors and impeccable color accuracy at an affordable price. L&H Companies maintains a 70,000 square-foot manufacturing facility that combines state-of-the-art equipment with two of the most advanced printing systems in the United States. Staffed by certified fabricators with over 100 years of combined experience, the facility boasts a vast product manufacturing area that includes a pre-fabrication, fabrication, painting, welding, routing, vinyl, wiring and assembly, and printing departments. L&H Companies also operates one of the largest forming machines on the East Coast capable of forming and molding the most intricate of shapes. Other machining specialties include precision water jet cutting of any shape or font in any material to easily fabricate unique, custom signage in a variety of styles including 3D cutout letters. Our experienced team of project managers will collaborate with you to move from the drawing board to tangible product in one streamlined process. We understand the challenges decision makers face and the tight deadlines that come with large programs and conversion projects. An up-to-date schedule is tracked from start to completion to assure that all requirements are achieved and the job remains on track. You need someone you can rely on, is well organized and focused on the details. An organization that is capable of taking the project lead and performing well in a timely manner. At L&H Companies, that’s precisely what we deliver. L&H Companies collaborates with designers, marketing managers and company decision makers to create an approach where all critical elements of a project are orchestrated and executed to produce a result that can only be characterized as exceptional. 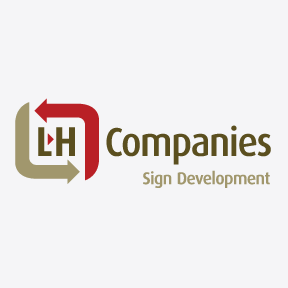 L&H Companies commitment to quality, precision, and customer satisfaction shows in every sign we manufacture. Contact us at (610) 898-9600 or [email protected] for more information.